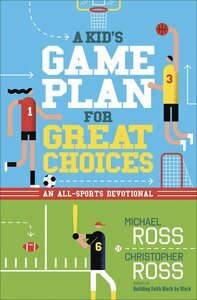 From the father-and-son team of Michael and Christopher Ross comes this unique devotional combining your kid's love of sports with faith and life lessons to encourage growth. These forty devotions feature stories from 15-year-old Christopher's world, plus kid-relevant teachings that bring Bible verses to life. A Kid's Game Plan for Great Choices will help your child see the connection between the things they love and the One who loves them. About "A Kid's Game Plan For Great Choices: An All-Sports Devotional"
Michael Ross is an award-winning journalist and the author, co-author, and collaborator of more than 32 books for Christian families, including the Gold Medallion winner BOOM: A Guy's Guide to Growing Up (Tyndale), and a bestselling parenting guide What Your Son Isn't Telling You (Bethany House). Michael is the former editor of Breakaway, a national magazine for teen guys published by Focus on the Family. Today, he oversees Back to the Bible's book publishing efforts. He and his wife Tiffany live in Lincoln, Nebraska, with their son Christopher. Christopher D. Ross gained his M.A. in English from the Bread Loaf School of English at Middlebury College, and his B.A. from Denison University. He has taught high school English for the past fourteen years in Charlottesville, Virginia, and will soon be teaching American literature to 11th graders in Harlem, New York. This is his first published book.